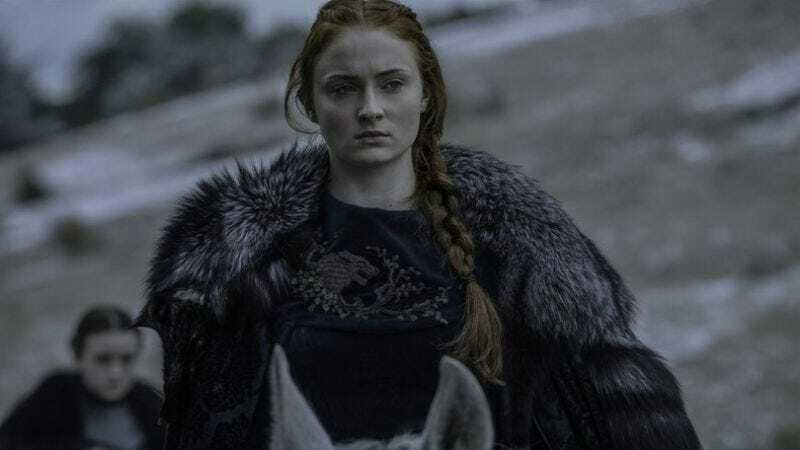 In news that could make the protracted wait for a new season even less bearable, Game Of Thrones star Sophie Turner recently teased the demise of some major characters in the show’s penultimate outing. Speaking to Variety on the Emmys red carpet last weekend, Turner said the cast has been getting a bit misty-eyed about the eventual parting of ways, now that HBO’s confirmed there are only two shortened seasons left. “It’s quite sad. It really feels like things are wrapping up and coming to an end,” Turner told the publication, now that the thrill of vanquishing Sansa Stark’s most deplorable enemy has presumably subsided. Cast members are lingering in Belfast to hang out for what might be the last time, as Turner reveals that not everyone’s making it out alive next year: “We’ve got one more season…well, not all of us.” The fact that Turner emphasized the cast’s camaraderie suggests these deaths will be major ones, since they can’t have grown too attached to the new Dothraki (then again, who knows?). Now, this shouldn’t surprise anyone, given George R.R. Martin’s propensity for killing off his and your faves. And you’d think Sansa would be inured to the loss of loved ones by now and just ready to join Daenerys in ruling Westeros. That could still be the case, as Turner says this season will see Sansa figuring out where her loyalties lie.